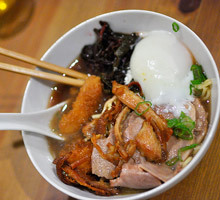 Richie Nakano had been experimenting with homemade ramen for a few years when he decided to travel to New York for a tour of the city’s ramen hotspots. After slurping, tasting, and biting into tangles of house-made noodles in places like Ippudo and Ramen Setagaya, his curiosity had been transformed into a plan. When he returned to San Francisco, he decided, he would use all homemade, locally sourced ingredients to create a bowl of ramen all his own. Nakano, who was the sous chef at NOPA at the time, joined forces with Kitty Gallisa, a bartender at NOPA, to form Hapa Ramen. For the last year, the business partners have developed Hapa (as a pop-up) on top of their jobs at the restaurant; this month Nakano is leaving NOPA to make Ramen full time. Their new booth (which will appear next Thursday, June 17) at the Thursday Ferry Plaza Farmers Market is central to their plan, along with a yet-to-be-determined regular pop-up venue. Nakano, who is part Japanese and has family from Hawaii, likes the way the Hawaiian word “Hapa” sums up his goal with the project. Generally used to mean “of mixed race” in the islands, Nakano says it also reflects his interest in combining traditional Asian techniques with modern Western ones. Nakano has worked meticulously to perfect the stock at the base of his ramen. Each batch starts off with dashi, a traditional Japanese soup base, made with kombu seaweed he sources from Tomales Bay. Then he’ll add some combination of pork bones (from Becker Lane or Long and Bailey), chicken (from a co-op in the Central Valley), and a variety of aromatics. He’ll simmer it all on a very low heat for as long as 72 hours. Nakano is happy to talk about everything he adds to his ramen. “We want to take away the mystery,” he says. 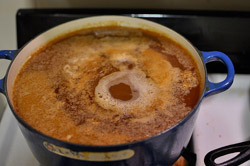 “A lot of chefs treat their broth like a closely guarded secret. We want to take the opposite approach and share everything with everyone…recipes, techniques, ideas.” For instance, Nakano has been exchanging ideas with Namu’s Dennis Lee, who serves his own version of the soup. Hapa Ramen’s first day in the market will be Thursday, June 17. 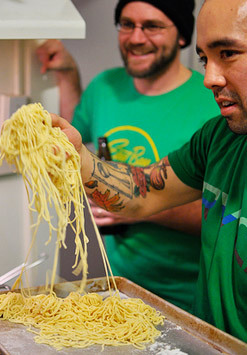 Photos of Richie Nakano and his stock by Jesse Friedman of Beer & Nosh.